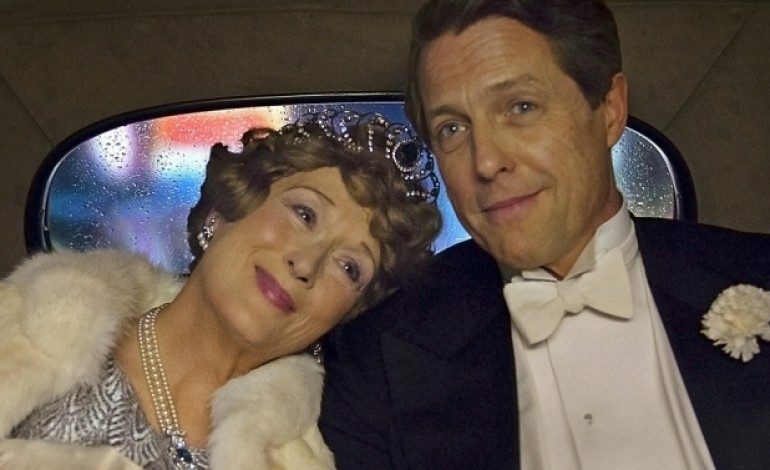 From The Queen and Philomena director Stephen Frears comes another fascinating true story, Florence Foster Jenkins, starring Meryl Streep (The Devil Wears Prada) and Hugh Grant (About a Boy). Streep will portray the eponymous New York socialite who had big dreams of becoming an opera singer – note the stars in her eyes in the above photo. While to her own ears she had a beautiful voice, the rest of the world heard something comically abysmal. Her aristocratic husband and manager, English actor St. Clair Bayfield (Grant), kept this reality from her until an upcoming concert at Carnegie Hall in 1944 threatened to expose the secret. English television writer Nicholas Martin wrote the screenplay. The film also stars Rebecca Ferguson (Hercules), Simon Helberg (TV’s The Big Bang Theory), and Nina Arianda (Midnight in Paris). Frears’ previous films The Queen and Philomena were able to garner a great deal of Oscar recognition, namely for its lead actors. Judi Dench was nominated for Philomena while Helen Mirren took home the Best Actress award for her performance as Queen Elizabeth II. With Streep’s track record in that same arena as an additive, Frears’ latest film has some high expectations. Florence Foster Jenkins is currently being filmed in the UK. Before its release, Streep will star in the British women’s rights film Suffragette and as a rocker-mom in Ricki and The Flash. Grant will be appearing in the adapted Cold War spy film The Man from U.N.C.L.E.